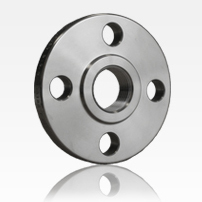 Threaded Flanges are confined to special applications. Their chief merit lies in the fact that they can be assembled without welding this explains their use in extremely high pressure services, particularly at or near atmospheric temperature, where alloy steel is essential for strength and where the necessary post weld heat treatment is impractical. Threaded flanges are unsuited for conditions involving temperature or bending stresses of any magnitude, particularly under cyclic conditions, where leakage through the threads may occur in relatively few cycles of heating or stress; sea welding is sometimes employed to overcome this, but cannot be considered as entirely satisfactory.